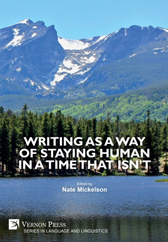 Guttman faculty members Dr. Nate Mickelson, Assistant Professor of English, Dr. Daniel Collins, Associate Professor of English, and Dr. Claire King, Assistant Professor of English, are featured in the new book Writing as a Way of Staying Human in a Time that Isn’t, a collection from Vernon Press that advocates for using writing as a practice for staying human. Edited by Prof. Mickelson, the collection features twelve essays from contributors at colleges and universities around the country. The human element of our work as writers, teachers, and scholars has never been more important. Writing as a Way of Staying Human in a Time that Isn’t proposes that intentional acts of writing can awaken us to our interconnectedness and to ways in which we—as individuals and in writing communities—might address the social and environmental challenges of our present and future world. Featuring essays drawn from a range of contexts, including college composition and developmental reading and writing, professional and legal writing, middle school English, dissertation projects, academic conferences, and an online writing group, the collection outlines three ways writing can help us stay human: caring for ourselves and others; honoring the times and spaces of writing; and promoting justice. Each essay describes specific strategies for using writing as a means for staying human in inhuman times. The authors integrate personal stories, descriptions of classroom assignments and activities, and current research in writing studies. Their work shows that writing can contribute to personal, social, and political transformation by nurturing vulnerability, compassion, and empathy among students and instructors alike. Nate Mickelson is Assistant Professor of English at Stella and Charles Guttman Community College, City University of New York, and Associate Chair of the Assembly for Expanded Perspectives on Learning (AEPL). He was lead organizer of AEPL’s 2017 conference “Writing as a Way of Being Human.” He is the author of City Poems and American Urban Crisis, 1945-Present (Bloomsbury Studies in Critical Poetics). His articles have appeared in Journal of Urban Cultural Studies, Transformative Dialogues, Journal of College Literacy and Learning, and Learning Communities Research & Practice.